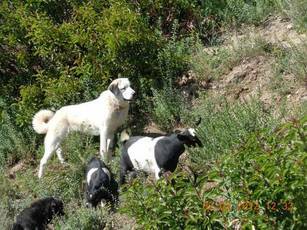 Toli is our alpha female LGD here at the farm. 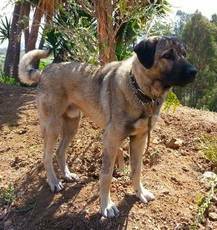 Toli is a purebred Anatolian Shepherd and lives with the goats full-time in their pasture. When we let them out to free-range and graze, she is right there with them following the herd around. Toli is an amazing LGD; she barks at strangers and predators, but she is not an "excessive barker", she only barks when something is amiss! She is what we call a 'Watcher", she will sit back and watch to make sure everything is ok with her herd. Our second LGD ever to the farm, we feel very fortunate to have been able to add her to our farm guardian pack.